A rather crazy episode even by the series' usual standards. The staff weren't kidding when they said there would be some new content. 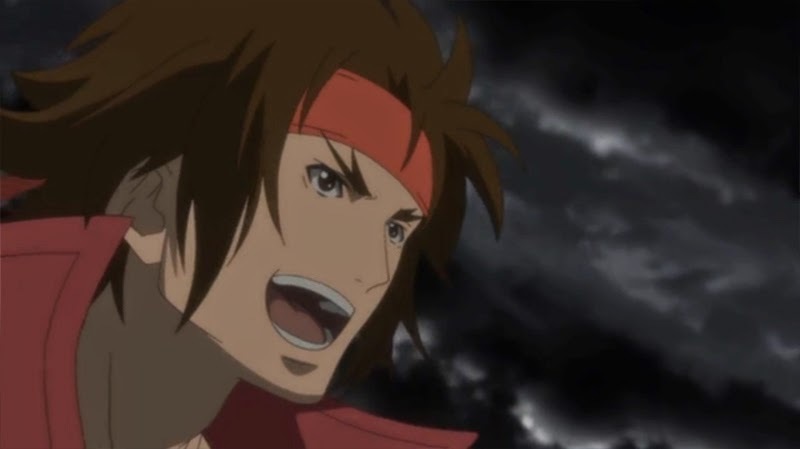 Now that the official simulcasts are beginning it's been confirmed that the alternate title Sengoku Basara -End of Judgement- is being used outside Japan. I'll keep using Judge End for consistency but they're the exact same show. This week's initial television broadcast on NTV is at 01:55 on Sunday morning (Japan time). The YTV and BS Nittere broadcasts are shown over a week late. This is a premium service. Fans can pay ¥900 to watch the whole series or ¥300 to see an individual episode. The first episode is free and the previous week's episode is shown for free on Fridays and Saturdays. The series airs slightly earlier than the television broadcast at 24:00 local time. Fans who pay Hulu's ¥933 monthly fee can watch the episodes slightly ahead of the broadcast time. The following Japanese streaming services will also be streaming Judge End; if you can't wait then it might be worth checking them to see whether any work in your region. I imagine they'll make the episodes available shortly after the television broadcast and some will be showing it for free. 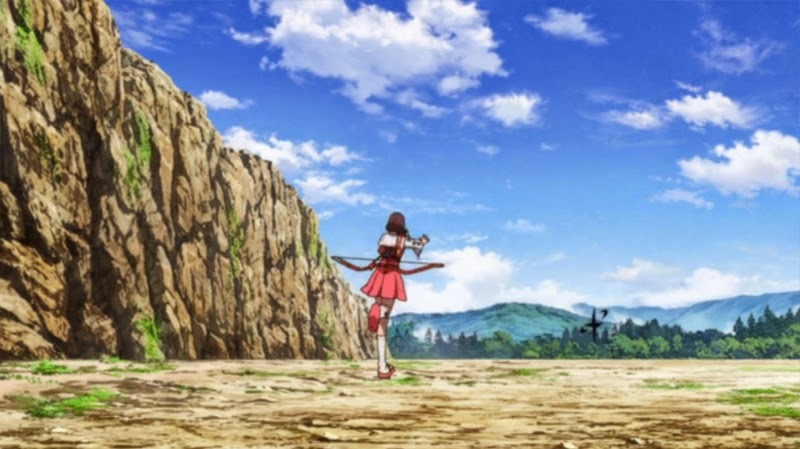 The episodes are streamed weekly on Saturdays at 14:20 Eastern Time with English subtitles, even when the Japanese television broadcast is delayed. Subscribers can watch the latest episode on the same day it's available in Japan while free users have to wait a week. FUNimation also have the home video rights, so if the stream is popular the series should eventually be dubbed into English. Even though the videos are region-locked, fans outside the US can still visit the site and rate the videos to show that there's demand! 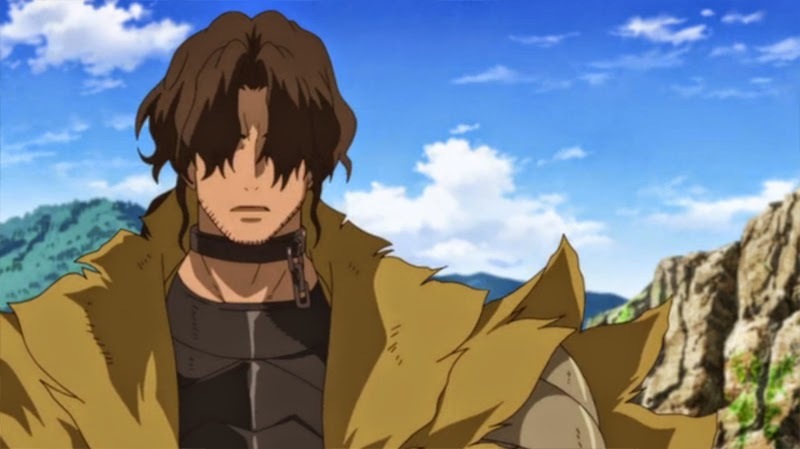 ADN are offering the series online with French subtitles. So far, the first eight episodes are available. They charge a monthly fee for the service. A French-subtitled broadcast will take place on J-ONE - Canalsat (50) and Numericable (38). It seems to have begun, so the schedule can be viewed at the link. The show's broadcast was announced as being 'day and date with Japan' but it took a while for them to catch up. They seem to have settled into a rhythm now and the first nine episodes are already online with English subtitles. Viewster is a free ad-supported service. Like many fans around the world I live in a country which has been excluded from the licensed simulcasts. In spite of this I feel very strongly about supporting the official translated version when it's available rather than resorting to piracy. The Japanese distributors will use the official viewing figures to see how successful the show has been while the US anime distributors like FUNimation use them to decide whether to give new titles home video releases, whether to dub them and whether to go the extra mile and produce a high quality premium release. 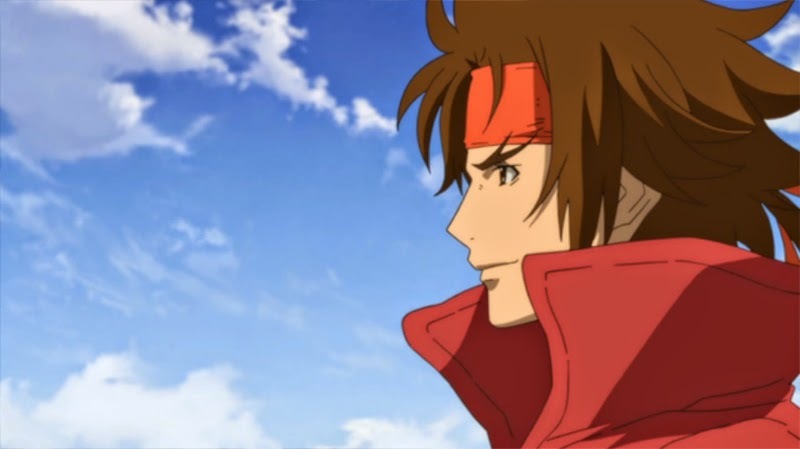 If we want Sengoku Basara Judge End to receive a decent western release and raise awareness of the series, we need to make sure people are watching the official streams if possible. Please get your friends to watch it too if you can so that the industry can see that there's an audience out there. It might help to visit the official streaming sites and leave supportive comments there too, even if you live in a country where the video itself is blocked and you had to watch it some other way. I'd rather not say how I'm watching the Japanese streams but it's not that difficult to find a method with some searching. 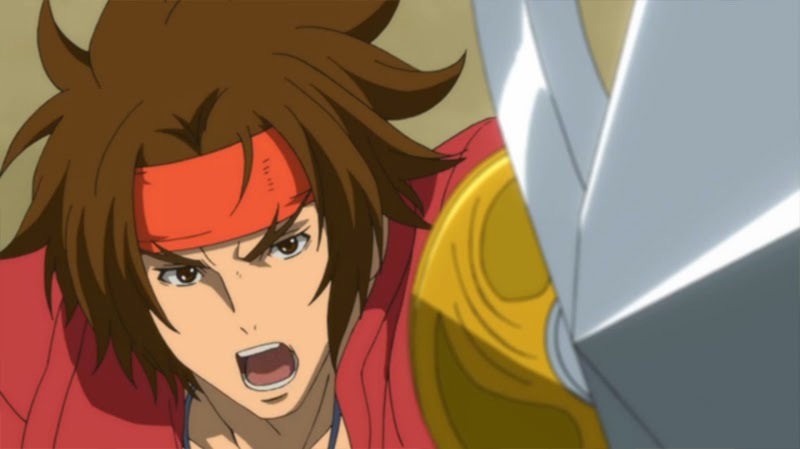 Sengoku Basara: Judge End is not a continuation of the previous anime adaptation. It's a brand new story and none of the events in Production I.G. 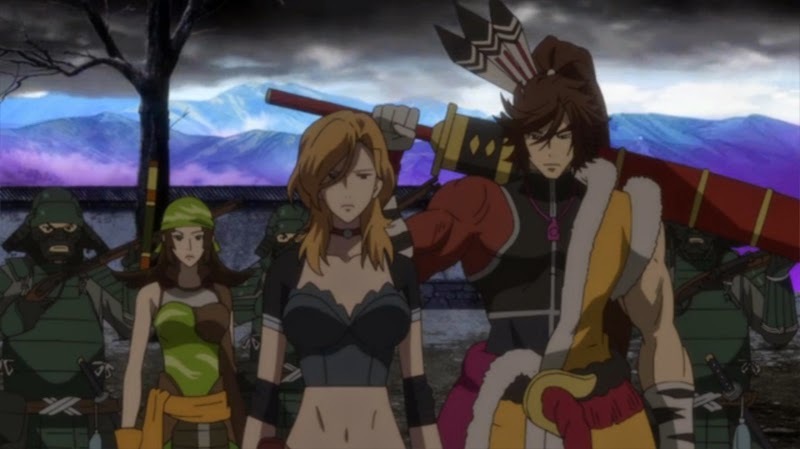 's version of Sengoku Basara have taken place in its timeline. 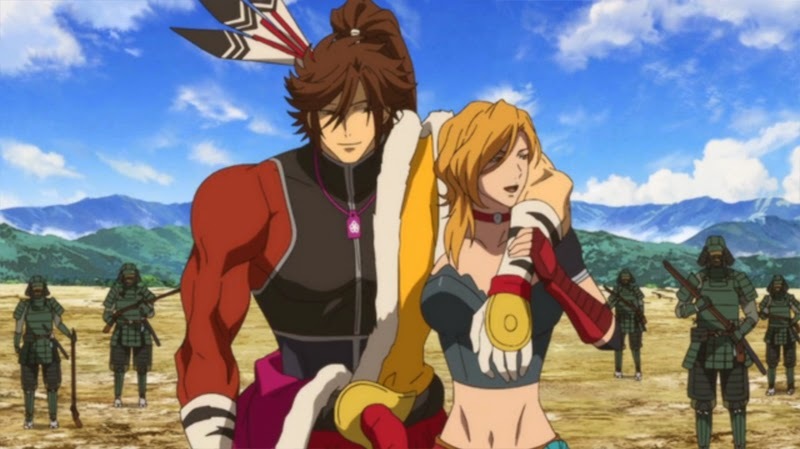 Please don't get confused trying to match the old story to the new one; this anime is a complete reboot of the entire Sengoku Basara scenario. The story takes place after the fall of Oda Nobunaga. 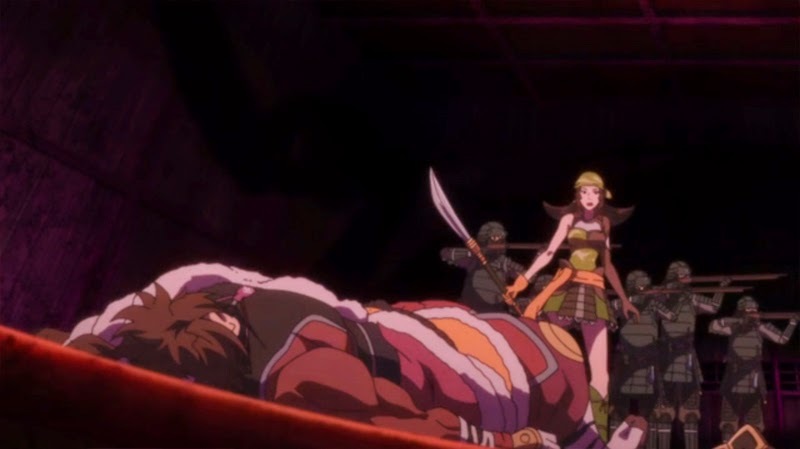 The rest of this post contains spoilers for the first ten episodes of Sengoku Basara: Judge End and some low quality screenshots. Please note that I'm watching the show in untranslated Japanese and using my preferred spellings for character names; they won't necessary match the localised spellings if you're watching one of the subtitled versions! 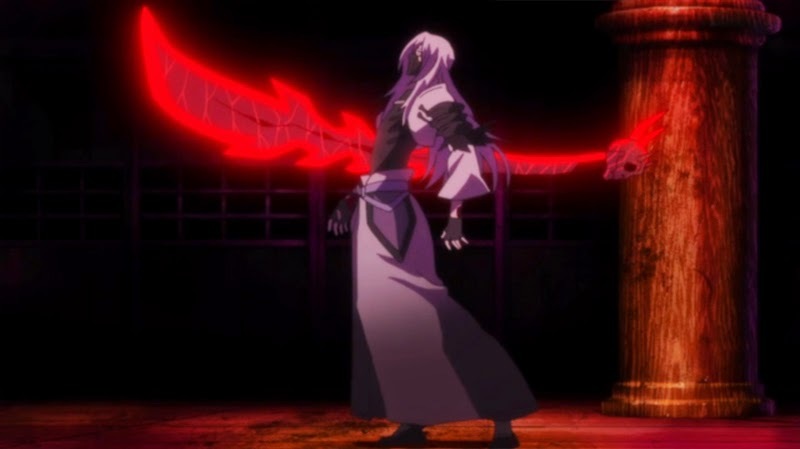 Prior to the events in Judge End, the warlord known as the 'Demon King', Oda Nobunaga, was betrayed and killed at Honnouji by his retainer, Akechi Mitsuhide. Mitsuhide was subsequently defeated by Toyotomi Hideyoshi, who went on to lead his powerful army across the land. 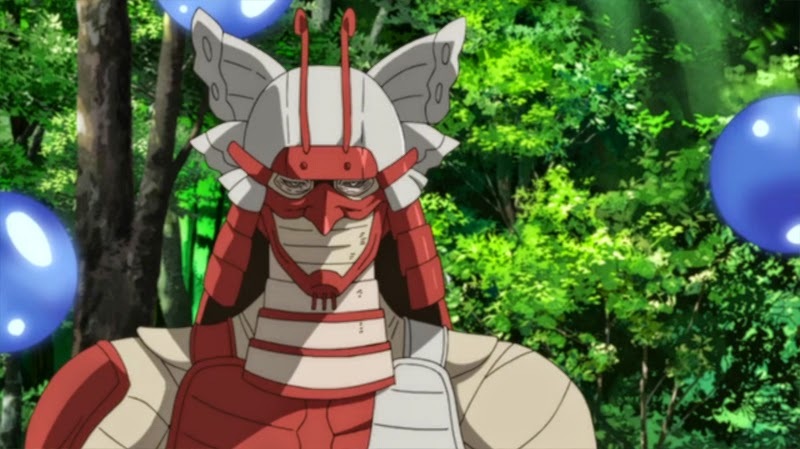 The series began with the Toyotomi army launching a major attack on Odawara Castle, home to the Houjou clan. The Date army tried to interfere and were brutally defeated by Ishida Mitsunari, a loyal warrior renowned as 'Toyotomi's Left Arm'. 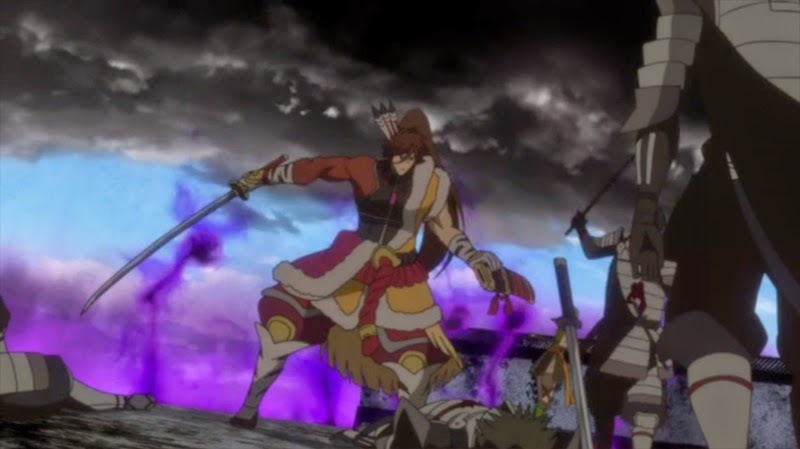 Despite their overwhelming strength, the Toyotomi attack was stopped when Tokugawa Ieyasu rebelled against Hideyoshi's methods and killed him in combat. Hideyoshi's devoted strategist Takenaka Hanbee died at Odawara too, leaving Mitsunari behind to curse Ieyasu's name and swear revenge against his former ally. 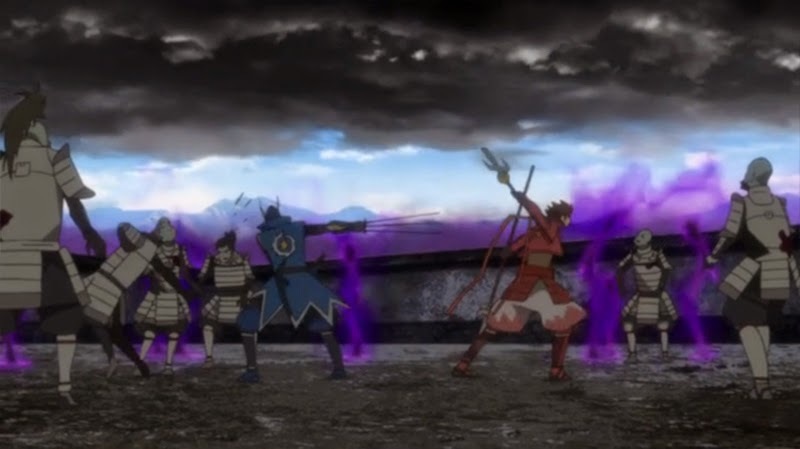 Since that day, Mitsunari and his loyal retainers worked to expand the former Toyotomi army by building alliances with the Mouri, Kuroda, Shimazu, Ootomo, Tachibana and Kobayakawa clans. 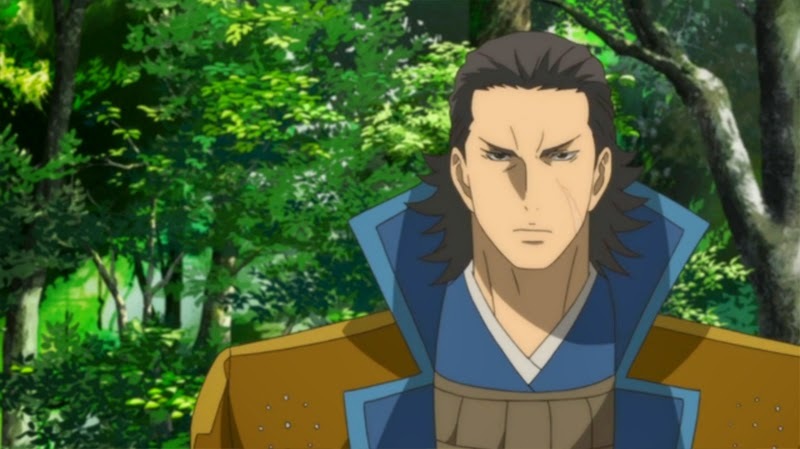 After some soul searching, the newly appointed general of the Takeda clan - Sanada Yukimura - decided that the Takeda forces would join Mitsunari's growing 'Western Army' too, bringing Uesugi Kenshin's trusted ninja Kasuga along with them. Meanwhile, Chousokabe Motochika struck out on his own after learning that his original reasons for siding with Mitsunari were based on deception. 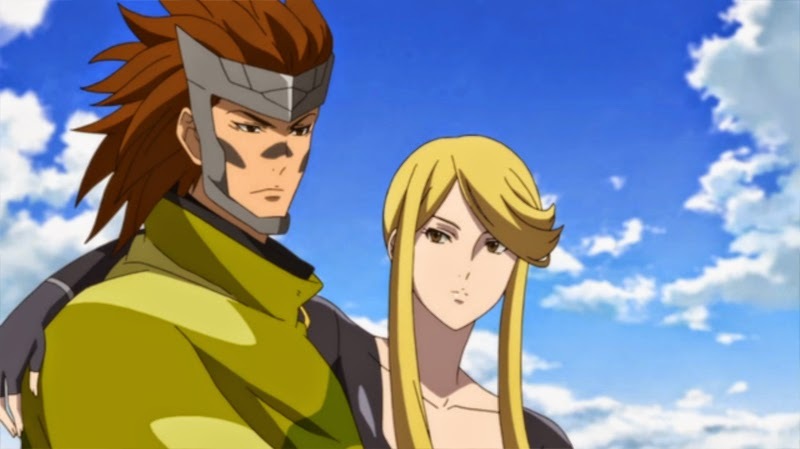 While all of this was happening, Ieyasu travelled around Japan in an attempt to unite other commanders and form an army to rival Mitsunari's. 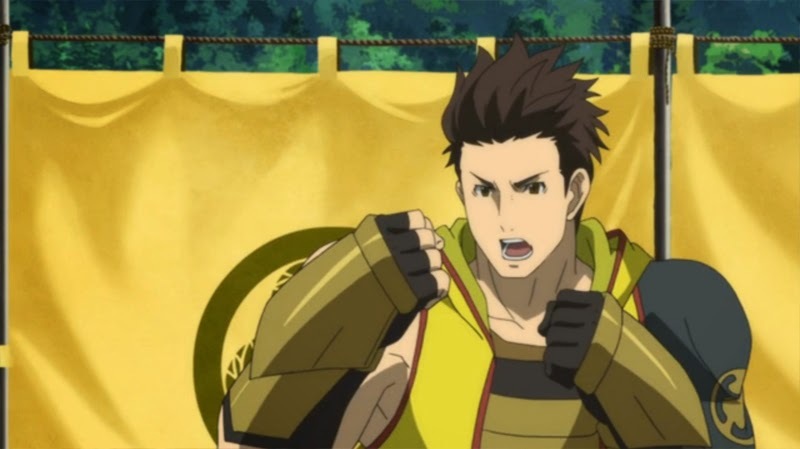 However, aside from the shattered remnants of the Houjou clan, Ieyasu struggled to gain supporters; his respectful approach was no match for the scheming of the Western Army's tacticians. 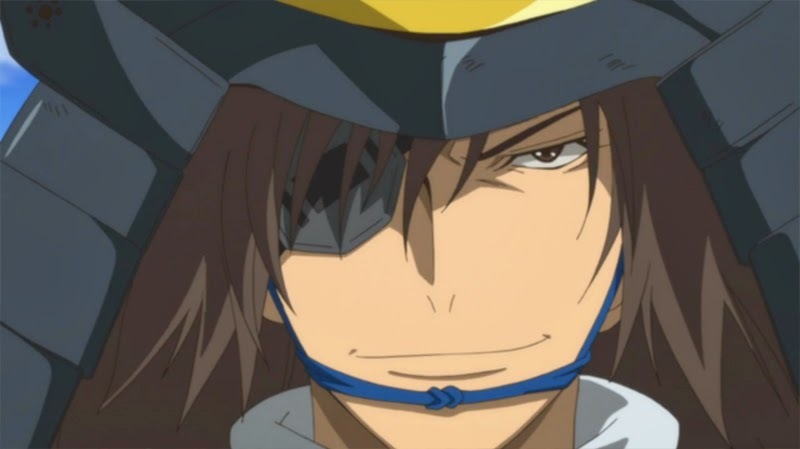 His luck changed when Yukimura's longtime rival Date Masamune declared his allegiance to the fledgling 'Eastern Army'. 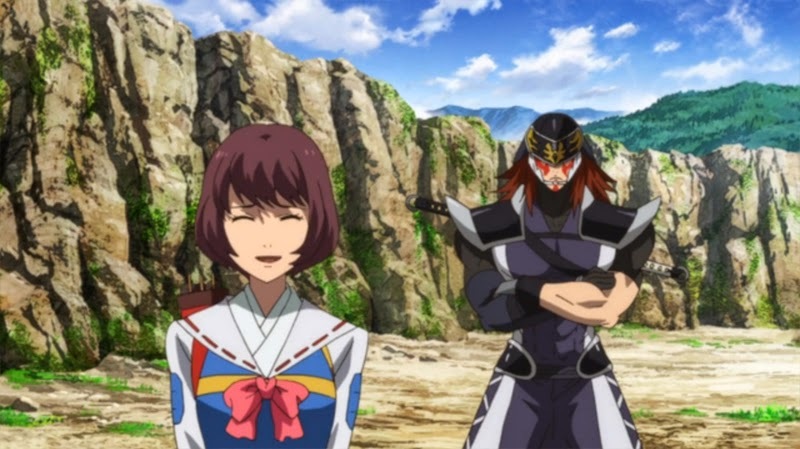 Elsewhere, Maeda Keiji joined up with the powerful Saika mercenaries, his aunt Matsu and the oracle Tsuruhime. 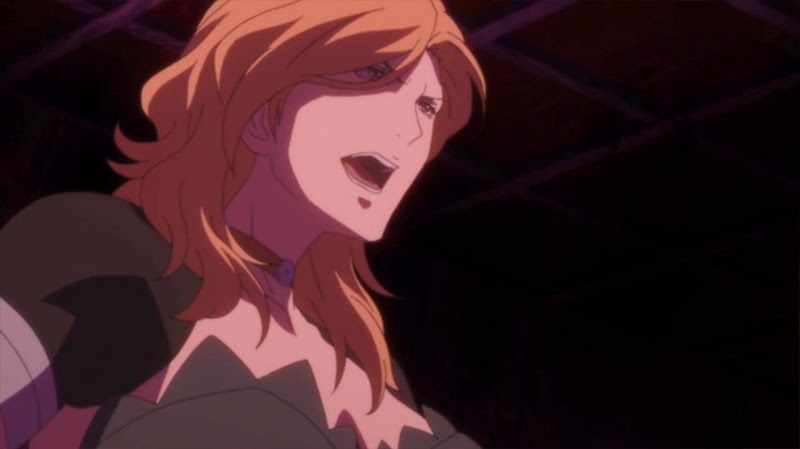 The group stumbled upon a troubling new discovery: Kobayakawa Hideaki's advisor, Tenkai, is actually Akechi Mitsuhide in disguise. As the Eastern and Western armies clash on the battlefield at Sekigahara, alliances are broken and new bonds are forged. 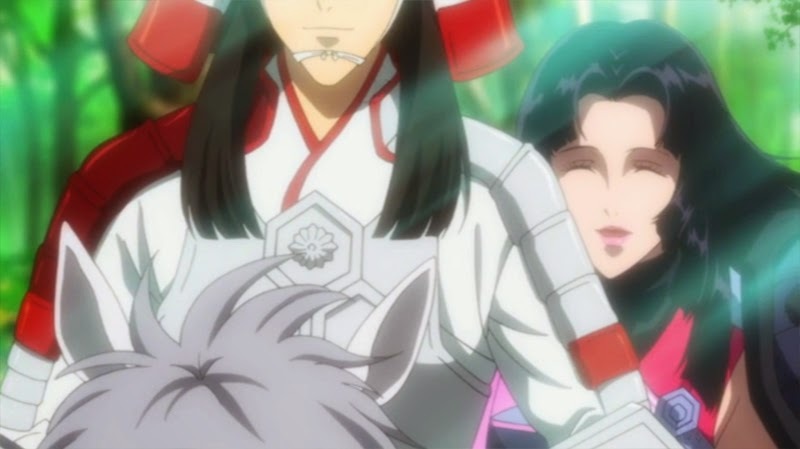 Mitsuhide reappears in the middle of the fighting with Oda Nobunaga's sister, Oichi, in his clutches. The skies cloud over and a dark temple which resembles Honnouji rises up from the crack in the ground. 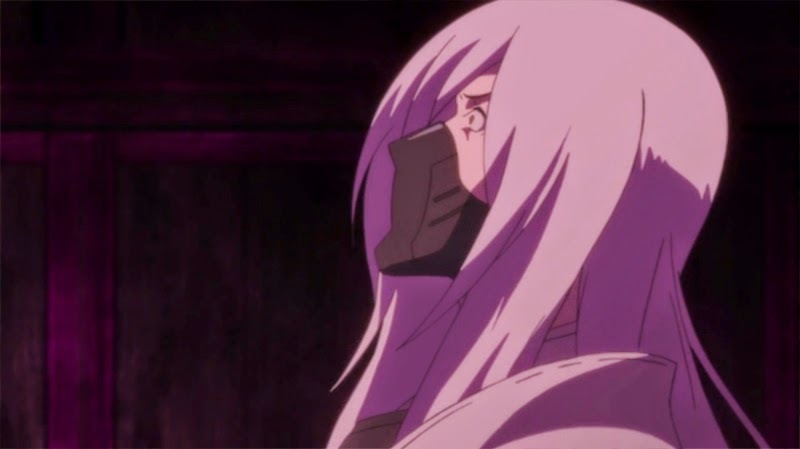 Will anyone be able to prevent Mitsuhide's plan to revive the Demon King? 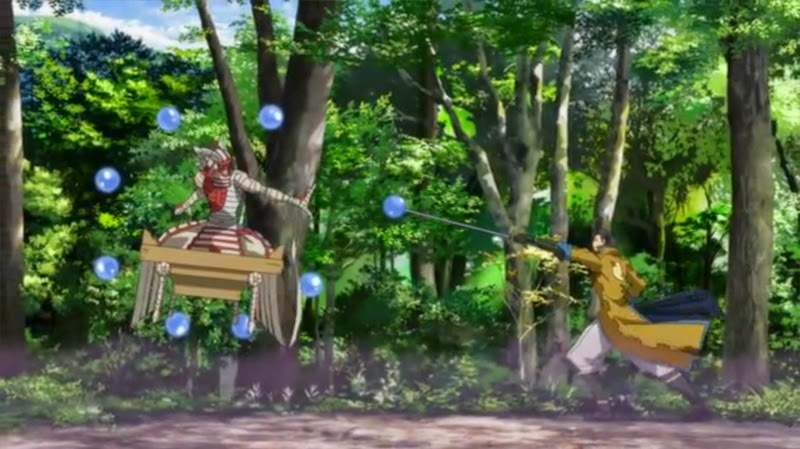 The episode begins with Masamune and Yukimura rushing in towards the fighting taking place around the dark temple. 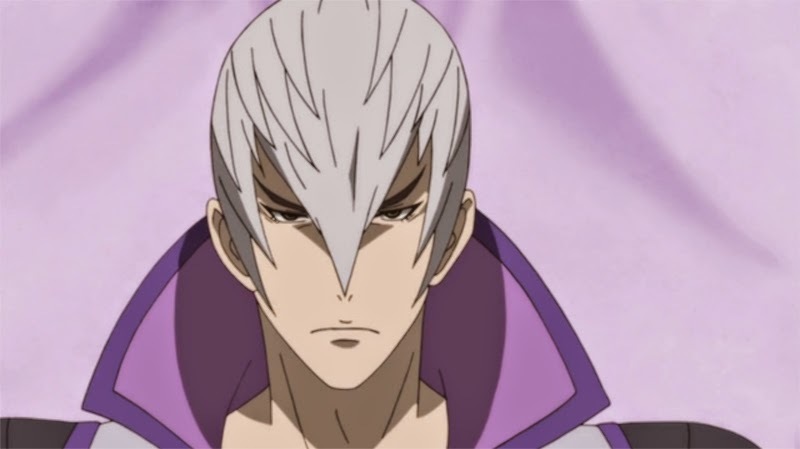 Like Mitsunari, they're not pleased by the new interruption to the battle they'd been looking forward to so much. In the heart of the disturbance, Kobayakawa Hideaki is back to being his usual cowardly self. 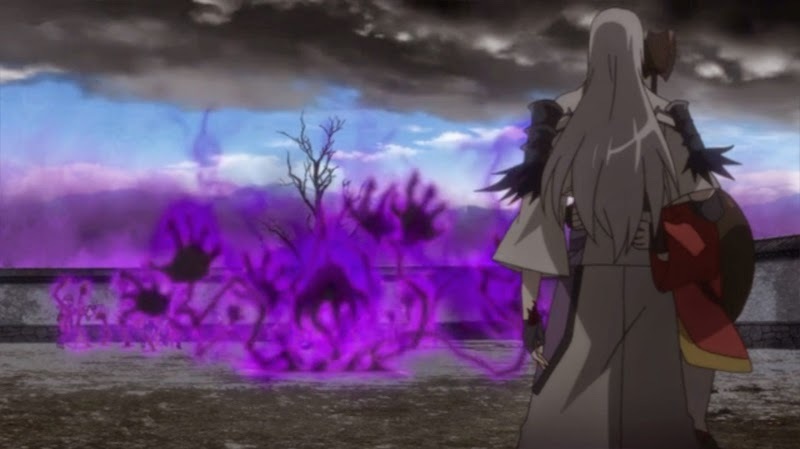 The rampaging dark hands grab him but he's saved by Tenkai (hereafter referred to as Mitsuhide). The two are briefly reunited. Until Mitsuhide sends Hideaki away to safety. 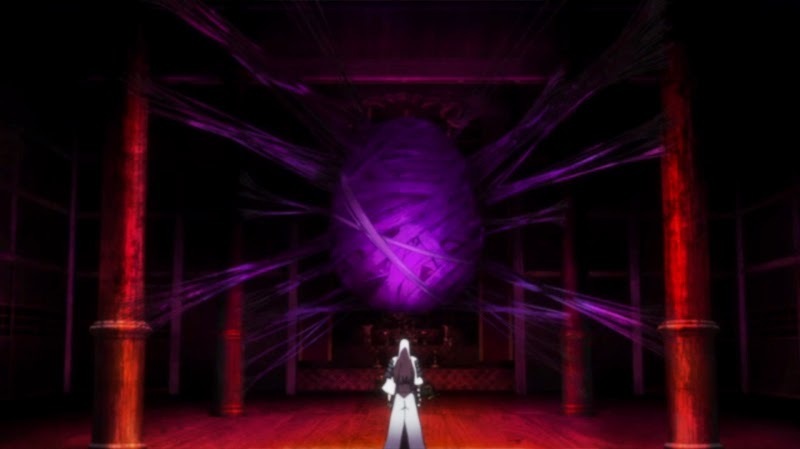 Mitsuhide then heads into the building which rose from the crack in the ground, alone. 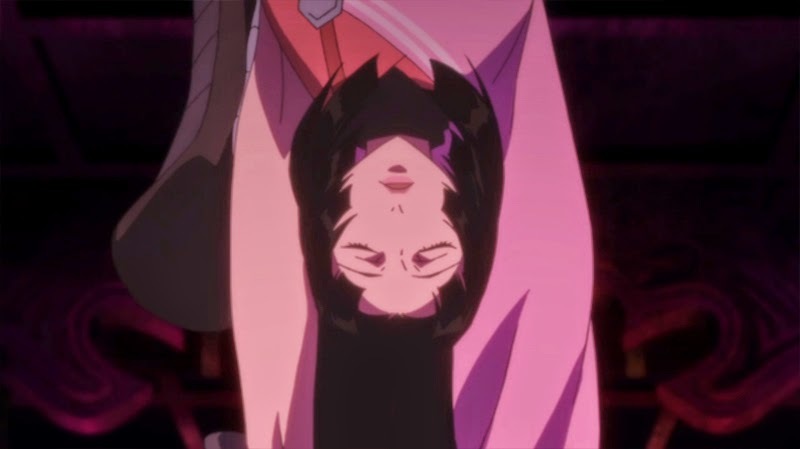 Inside, Oichi is suspended upside-down, surrounded by dark tendrils. The darkness forms a cocoon around her. Keiji, Matsu, Magoichi and Sasuke have their hands full. They're busy battling the zombified Oda soldiers outside the temple. 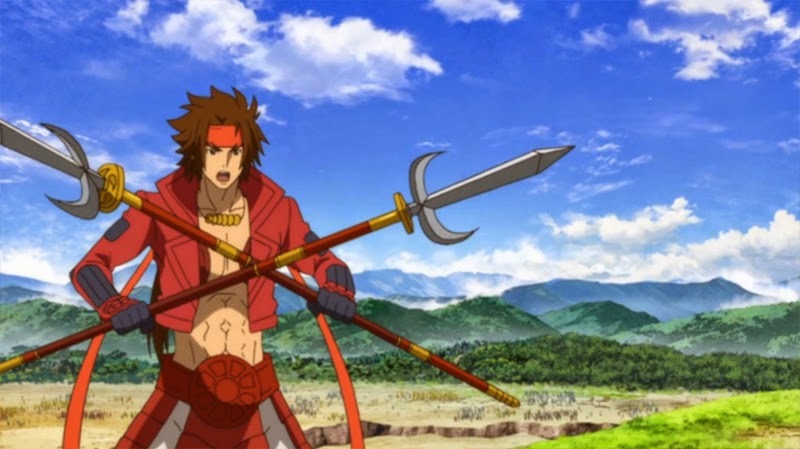 Thankfully, it isn't long before Masamune, Kojuurou and Yukimura arrive on the scene. Magoichi asks for their help. 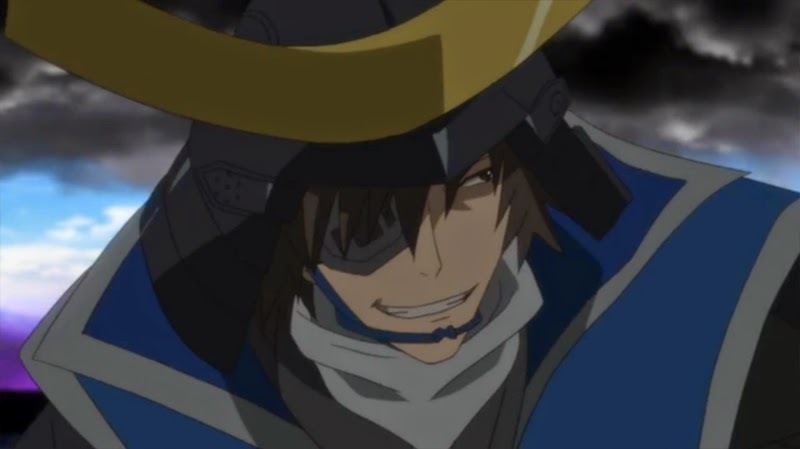 Masamune hesitates for a moment. The two join forces to fight off the monstrous Oda troops. They seem to be having a lot of fun. 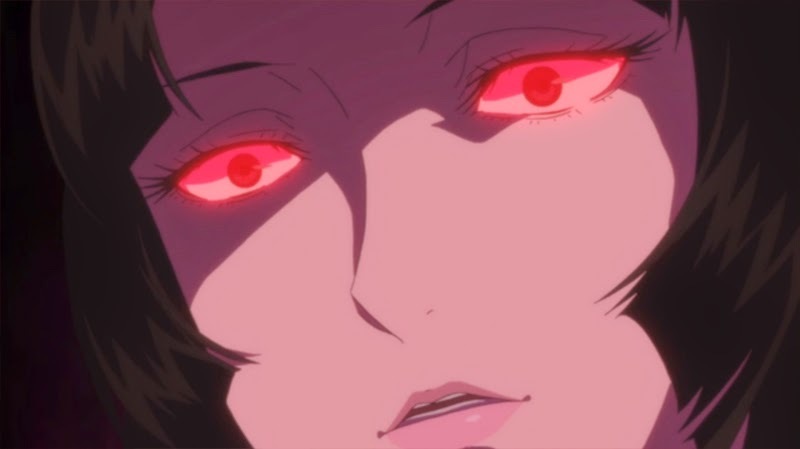 Magoichi speaks the famous words "The enemy is at Honnouji!" and heads towards the temple with her allies. Some distance away, Motochika and Motonari are fighting with their colossal weapons. Motochika is concerned at the dark cloud in the distance, but he has his hands full. Entering the temple, Magoichi and her group encounter Mitsuhide. 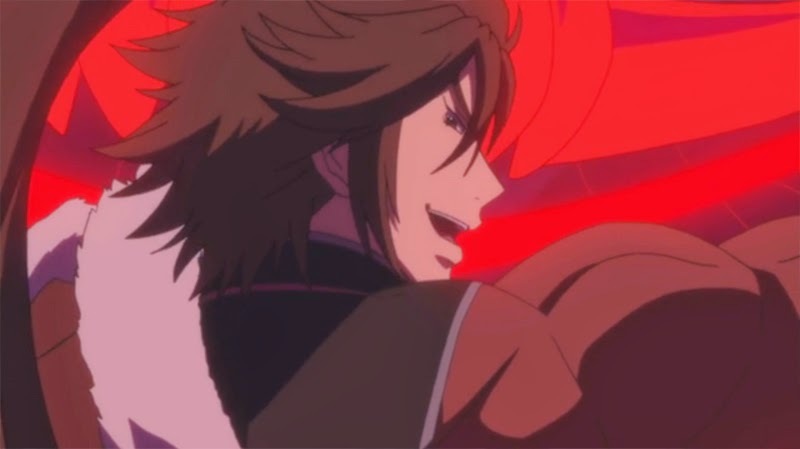 He proudly announces the revival of Nobunaga before being stabbed from behind unexpectedly. 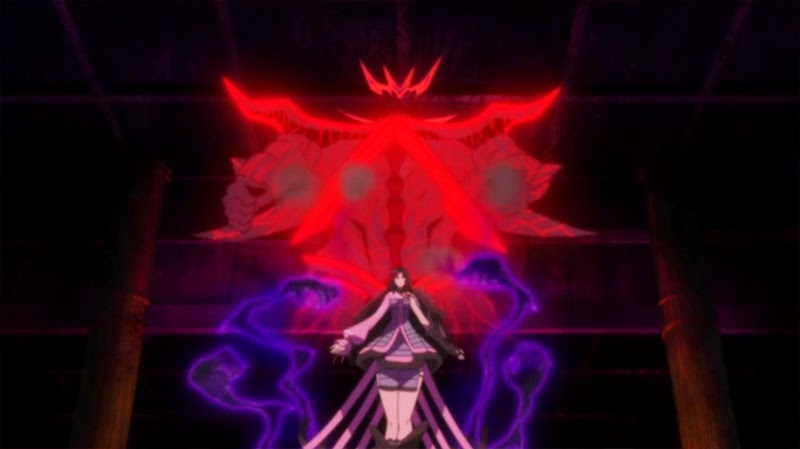 Oichi introduces herself as the Sixth Demon King. Mitsuhide falls to the ground, apparently dead. Oichi's soft voice has become deep and malevolent. 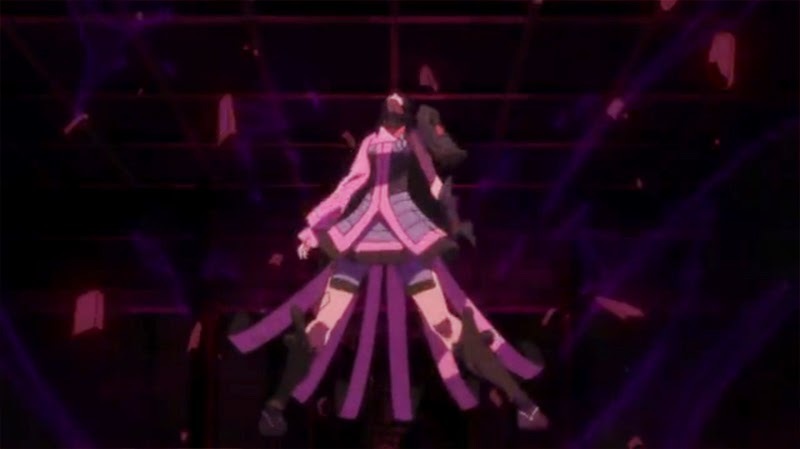 The shape of Nobunaga's demon hovers in the air behind her. Magoichi orders her troops to fire. Keiji tries to get between them to protect Oichi. 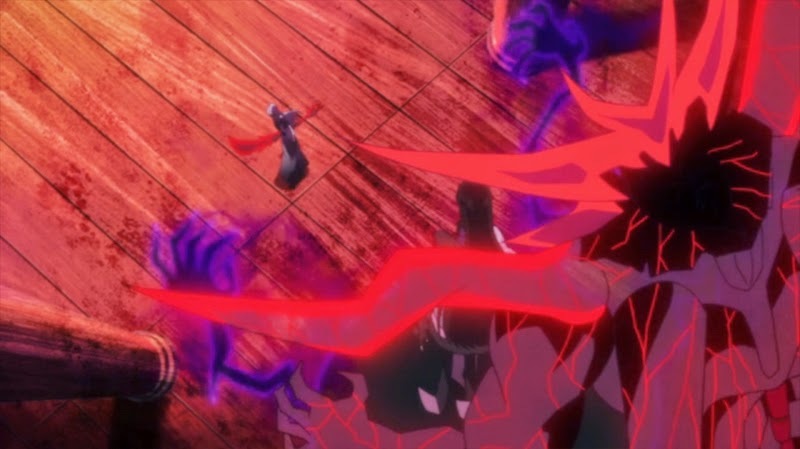 However, the demon swats him out of the way effortlessly. 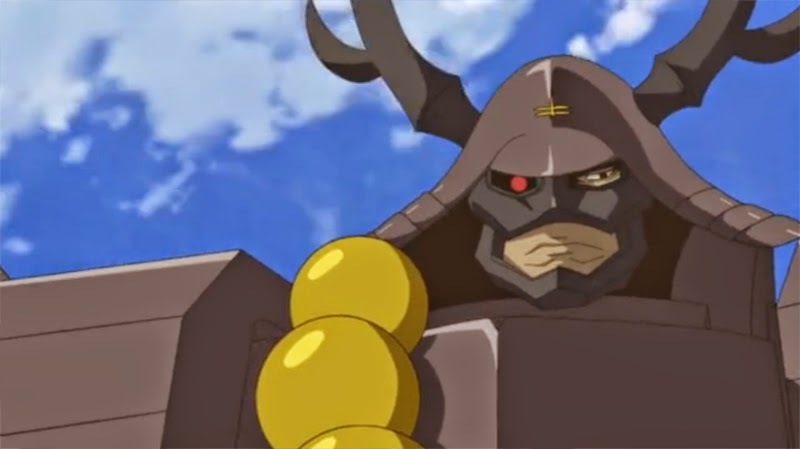 The bullets from Magoichi's troops have no effect on the demon. 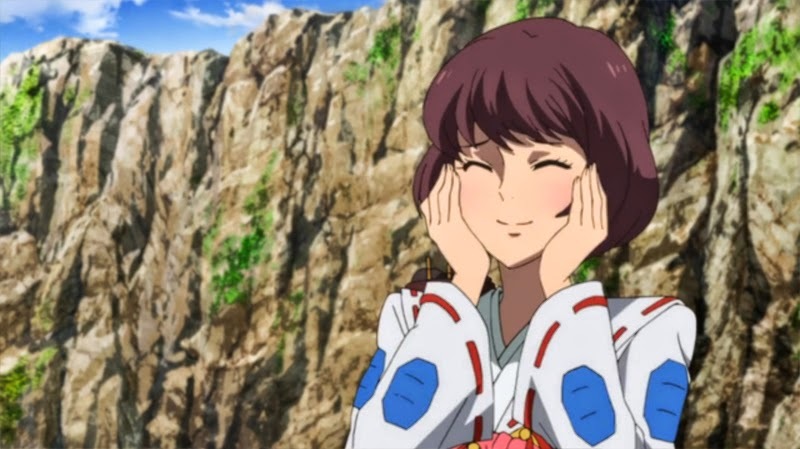 The soldiers continue firing as Oichi laughs at them. The next one to confront the demon is Matsu. 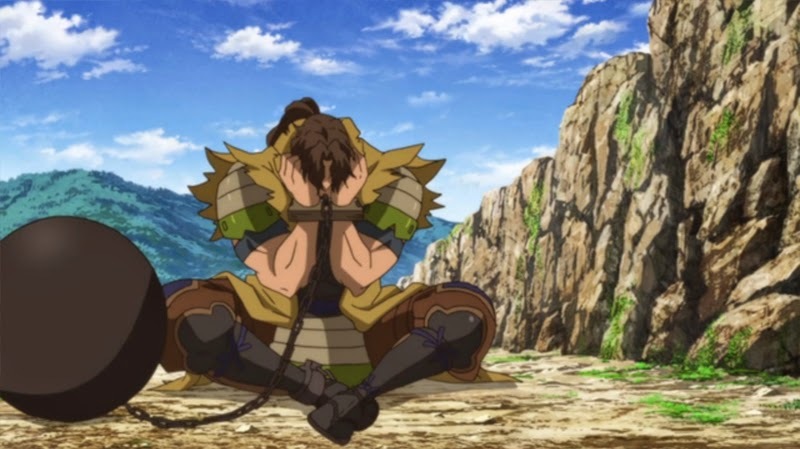 Her shouting forces Oichi to remember her dead husband, Nagamasa, and their past together. Matsu's words briefly snap Oichi back to her senses. It's not long before Oichi loses control again, but Matsu manages to buy Keiji enough time to recover. He tackles the demon head on and asks Magoichi to shoot. 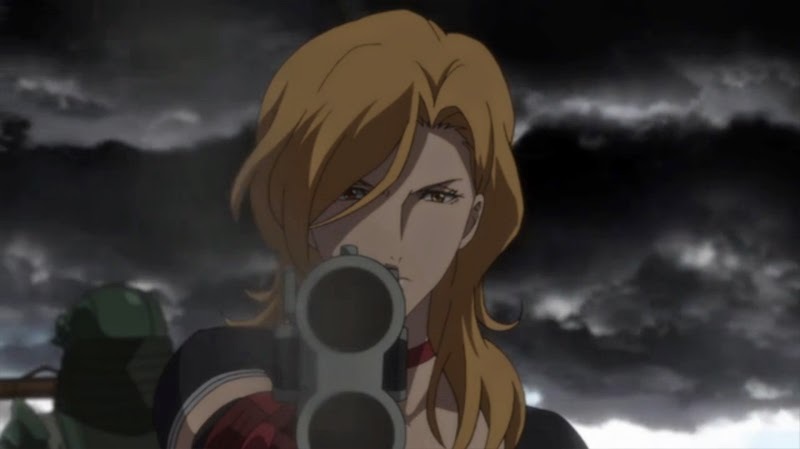 She hesitates for a moment, then fires on the demon. Although Keiji is wounded, the attack has the desired effect, defeating the demon. The temple begins to crumble and vanishes from the battlefield. Outside, the zombified soldiers fade away along with the dark miasma. 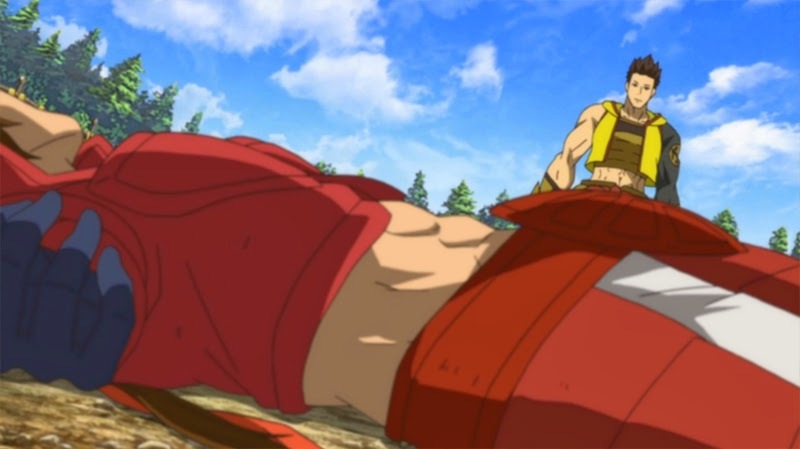 As the darkness clears, it reveals Kasuga lying unconscious nearby. Sasuke greets her. After a little of their usual verbal sparring it's clear that Kasuga is going to be fine. Magoichi worries about Keiji, who is still lying where he fell. Keiji will be fine, though. He's overjoyed that Magoichi called him by his name during the fight with Oichi. Matsu is taking care of Oichi, who seems to be fine (albeit unconscious). With the sky clear again, the battleground is back to its original state. The immediate danger is now out of the way, so the temporary truce between the two armies comes to an end. 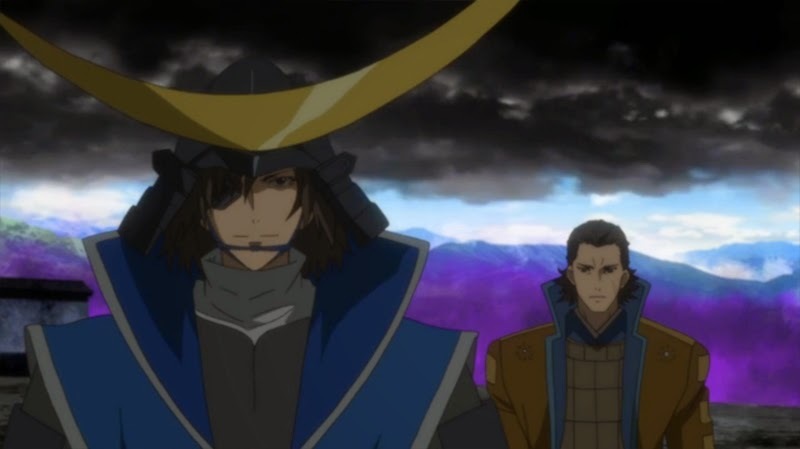 Masamune and Yukimura renew their promise to meet up again when the time is right. The other characters are still fighting elsewhere on the battlefield. Kanbee has finally engaged Fuuma Kotarou in combat. Tsuruhime arrives on the scene and demands that they both stop fighting. 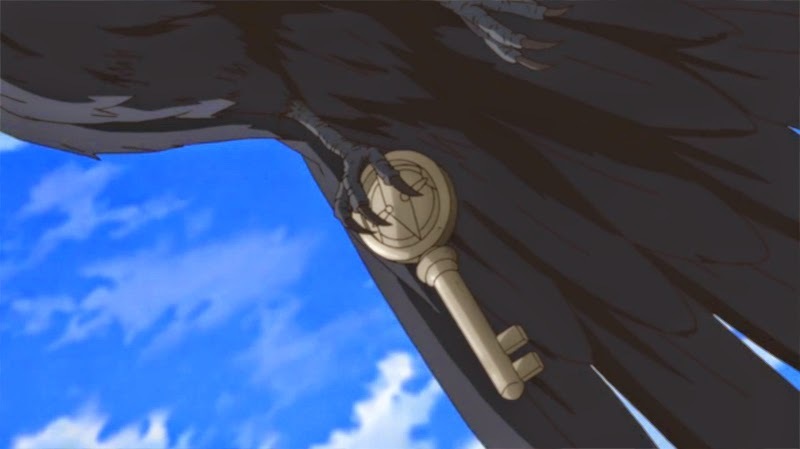 ...and explains that Kotarou doesn't have the key he's looking for, after all. However, a bird flying overhead at that moment does. With the key he's been looking for right in front of him, Kanbee is in despair. 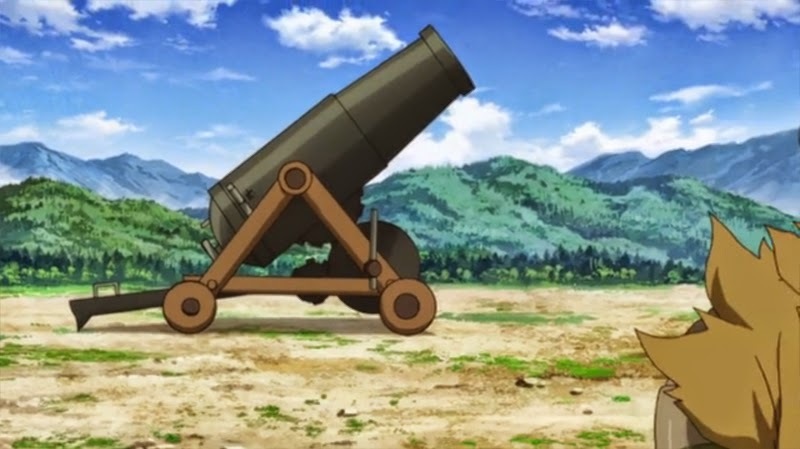 He fires himself out of a nearby cannon and begins his pursuit anew! Tsuruhime is left alone with Kotarou - or so she thinks. He stoically resists her advances. 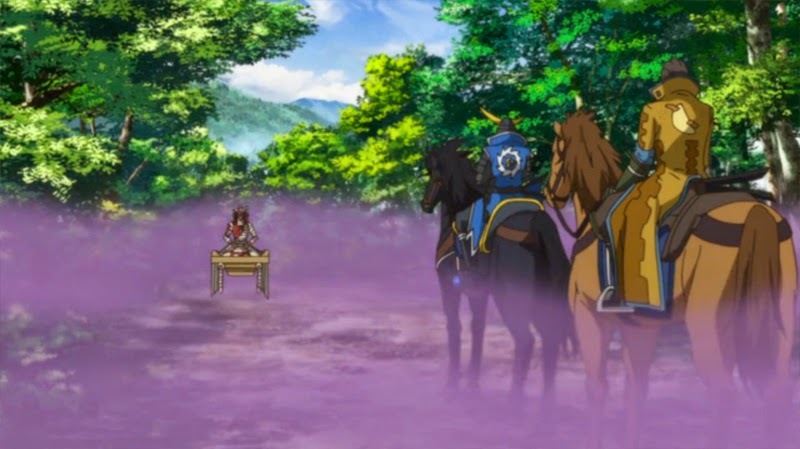 As Masamune and Kojuurou head towards Mitsunari, they're ambushed by Ootani Yoshitsugu and his poisoned thorns. 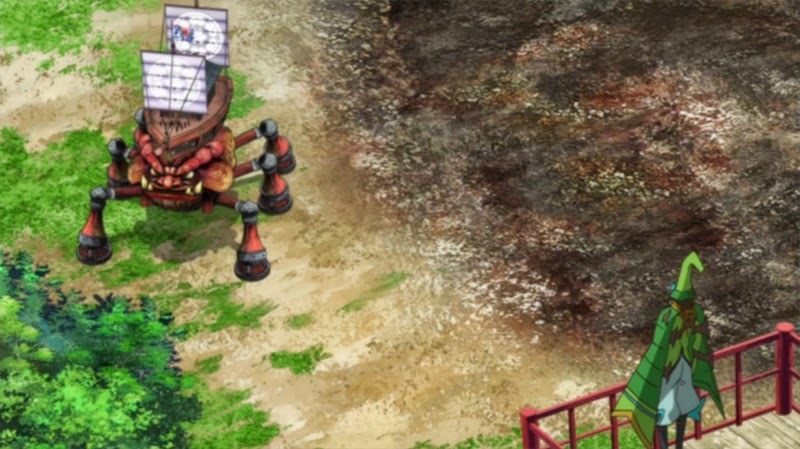 Kojuurou stops to face Yoshitsugu while Masamune heads off alone. 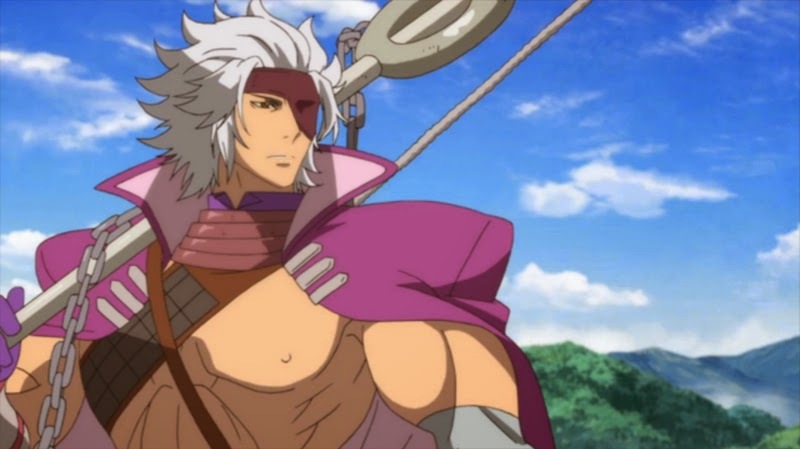 Meanwhile, Yukimura has reached Ieyasu's camp. Moments later, the two of them begin to fight. The disturbance from their confrontation can be seen from a distance. Yoshitsugu tries to use it to distract Kojuurou. However, Kojuurou's resolve is unshaken. Sasuke and Kasuga watch from the sidelines. Although Kasuga is worried that Sasuke isn't with his master, Sasuke says that Yukimura won't need his help, the way he is now. The battle between Shimazu Yoshihiro and Honda Tadakatsu is still raging on in the skies above Sekigahara. 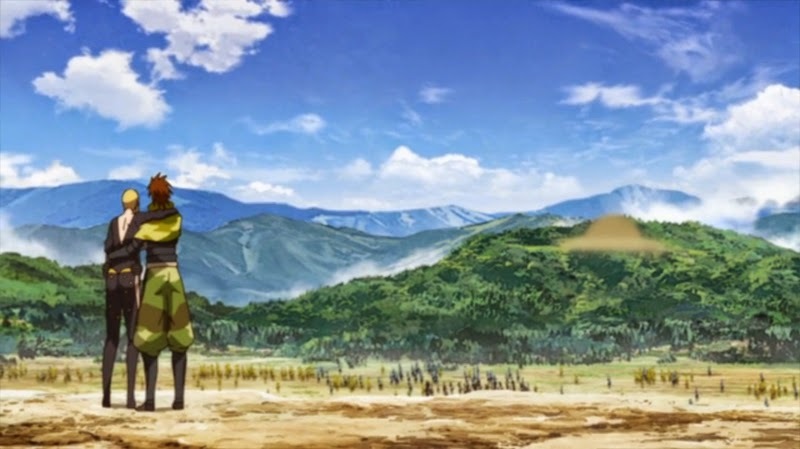 Tadakatsu glances at his lord's camp in concern. Down below, the duel continues. 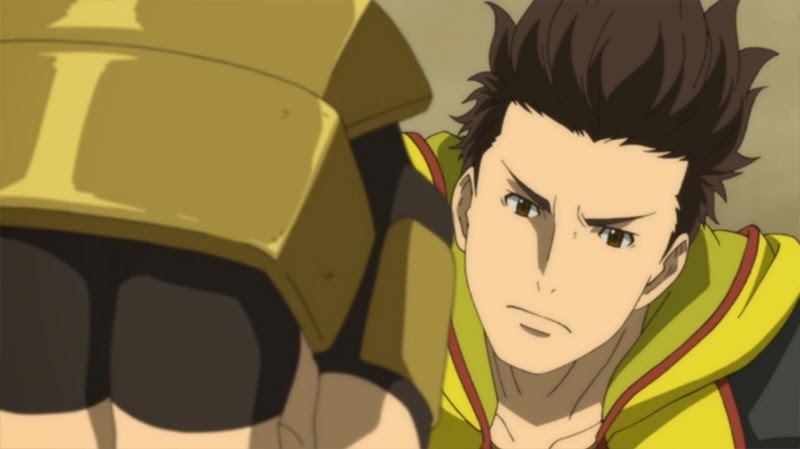 Yukimura and Ieyasu exchange as many words as they do blows. 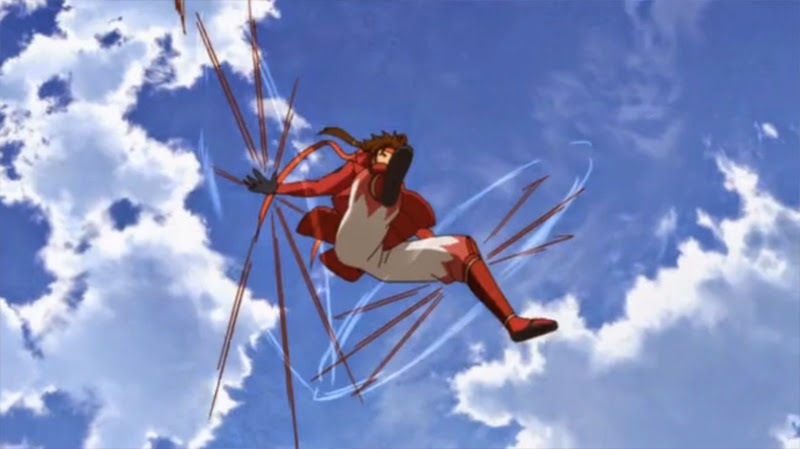 Yukimura's fighting style is very athletic. The pair seem evenly matched. ...the two men continue their dialogue. 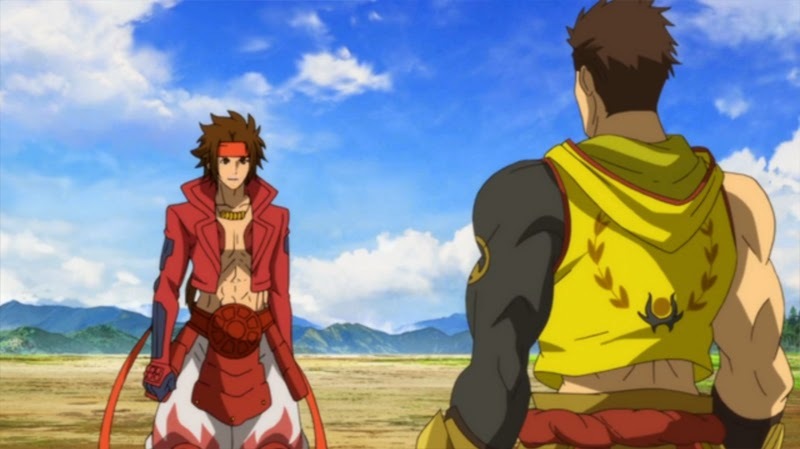 Yukimura challenges Ieyasu to be true to his feelings. 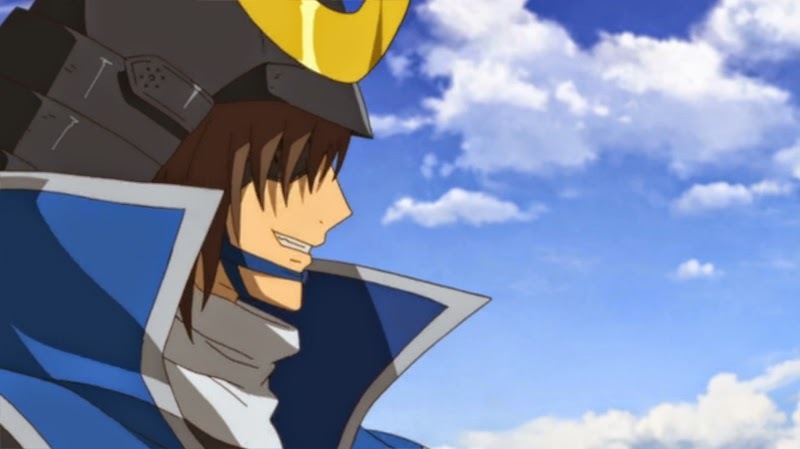 At last, Masamune reaches Mitsunari's base, ready for his rematch. We're going to have to wait until the next episode to find out whether he gets his wish. 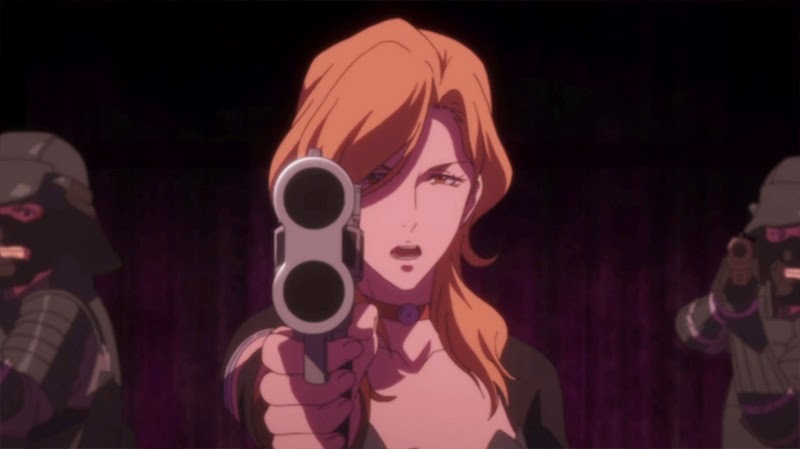 Next week's episode will be titled Shinpan ('Judgement'). The rest of the episode flew by again, just like last week's. 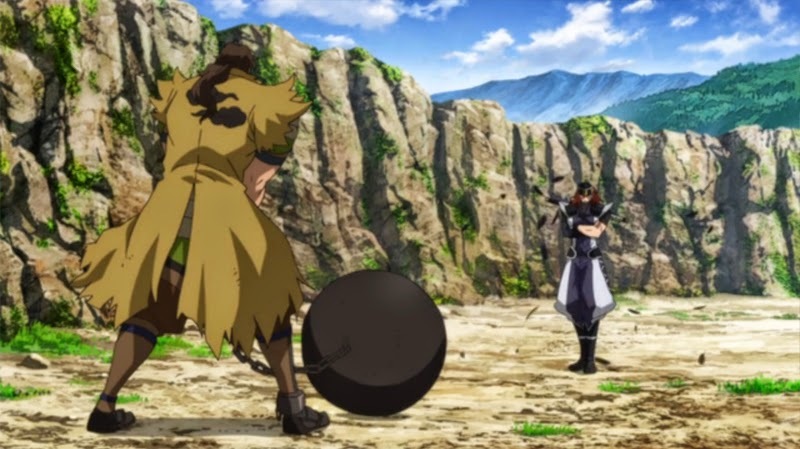 I'm glad that Matsu has a bigger role in this series than expected, and the Yukimura versus Ieyasu battle was cool! Gyoubu's fighting style seemed more accurately portrayed than it was in the movie, too. Ahem... Poor Kingo. Lost his only friend. 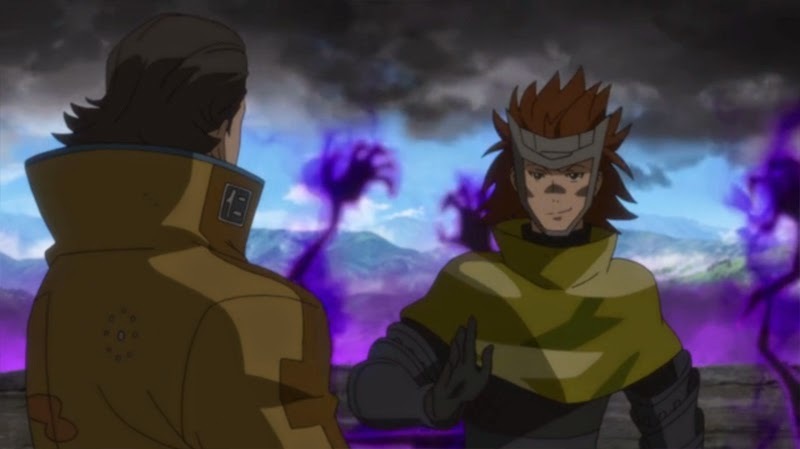 Interesting they showed a more human side to Tenkai, he normally seems to be just using Hideaki in the games. 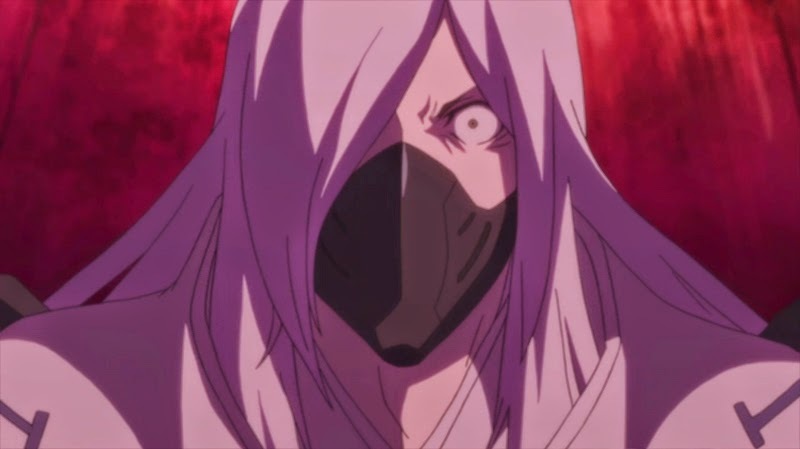 Anyway I felt the whole thing did feel kind of rushed, like they felt they needed to do it for Oichi, Tenkai, and Magoichi's sakes but didn't really want to do it at all. 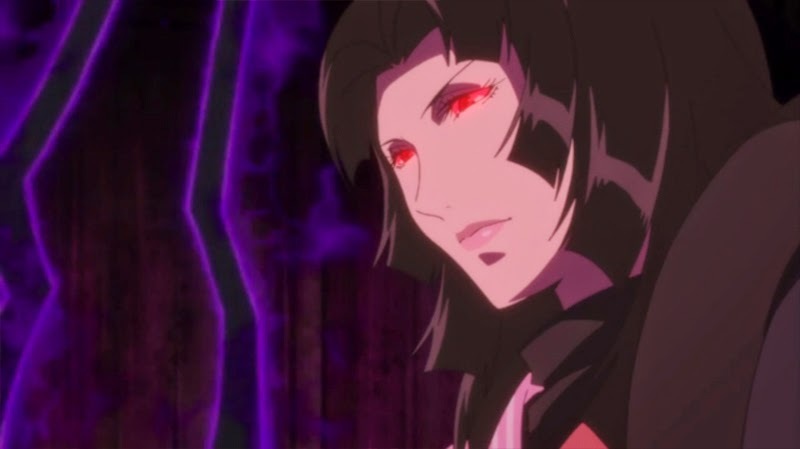 I certainly appreciate demonic Oichi though, and the ideas that brings to mind. Interesting tact on Matsu's part as well, which I suppose IS something only someone who knew Oichi well would be able to do. Saved everyone with her speech. Also that bird... It didn't look like an eagle, but, could this mean we might see Yoshiaki?! Even if it's just like a two minute long segment with Kanbei landing at Mogamigawa or something. Would be nice, I dunno. I will admit I'm rather disappointed Kenshin didn't get to show up, but that's on me for expecting it at all. No offense to Kojuuro or his fans (still feel sorry for how hard the guy got beaten) but that Kenshin got to even beat him up was good enough and more than I expected from them coming into this anime. 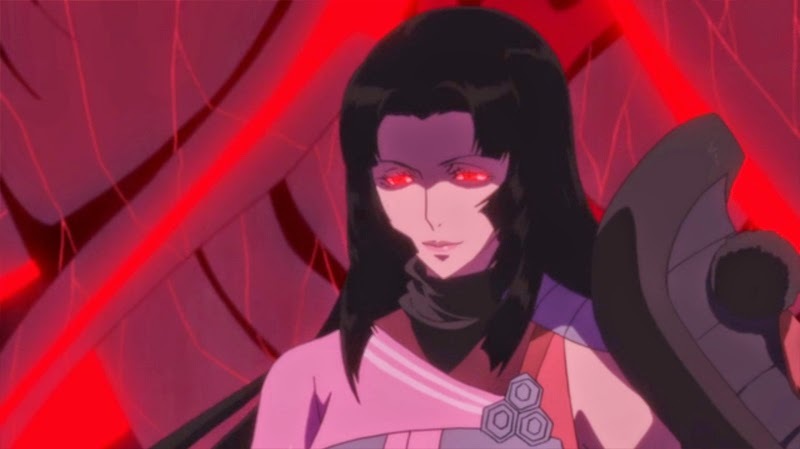 So, great, Oichi didn’t die by random lightening (was a bit hard to understand wtf happened last week okay) but instead trolled everyone by turning into Demon Queen with Nobu’s devil trigger/stand thing instead. Didn’t see that coming! 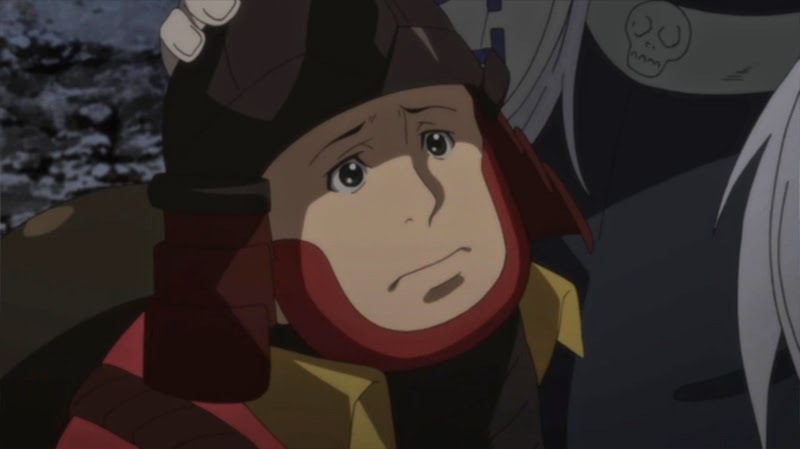 No Nobu-kun 4 u tenkai. Tenkai was kinda boring in JE…until he unexpectedly saved Kingo, that was cute, what the hell. 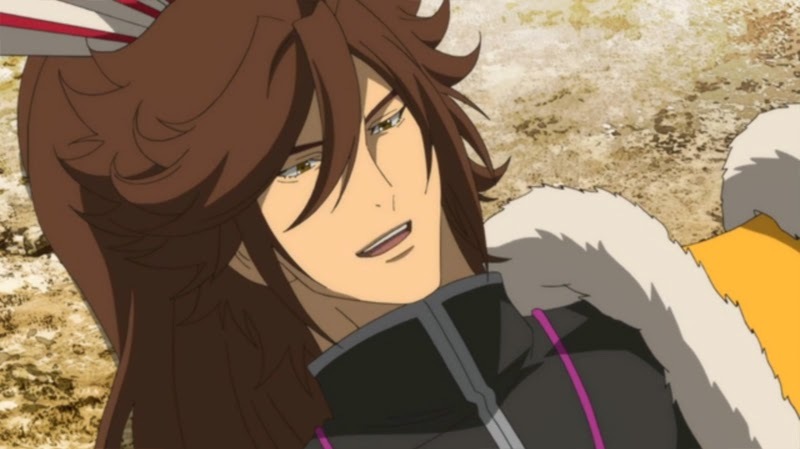 Nobunaga is in the OP though. Maybe he’ll stick his head up from the chasm in the next ep and give everyone a big scare. The whole thing suffered from being rushed as usual, I liked it though. They really should’ve gotten more episodes. 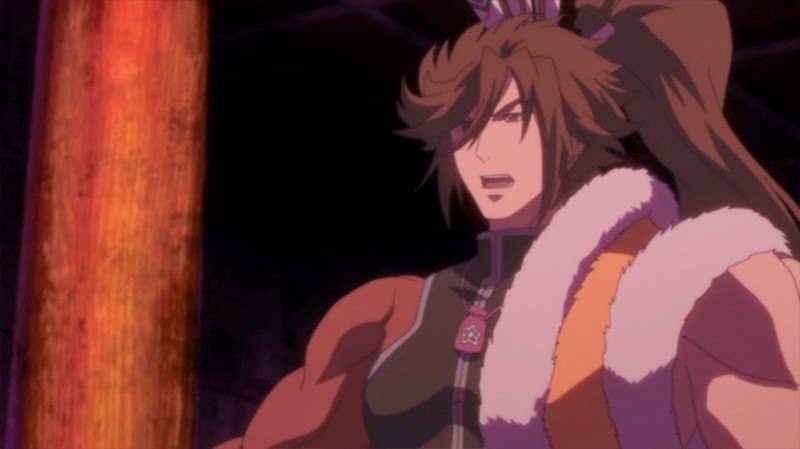 It was a beautiful moment when Yukimura headbutted Ieyasu but I can’t believe how Mitsunari just sat on a chair and did nothing during all this.. If Mitsuhide's real objective was to raise his chances in future popularity polls, his disastrous plan might have succeeded after all! I'd like to see Matsu get more to do in the games too (like when they finally give her a story and full move set again). 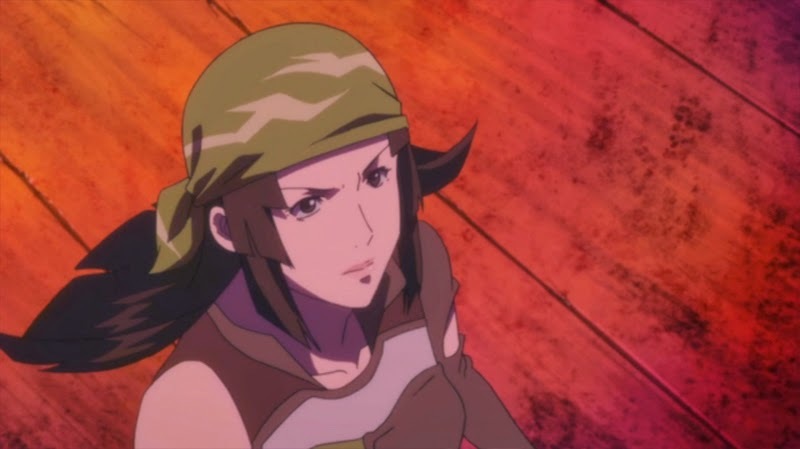 Her interactions with Toshiie are fantastic but she's a strong character in her own right as well. Yes she is, and she has a bear to ride on even! Where was it during all this? It would be nice if the Maeda couple got a brief reuniting scene here, they're so sympathetic. At this point I wonder how anyone can dislike Kingo (ok I get it, he can still be annoying) because he is so cute esp as an anime character. 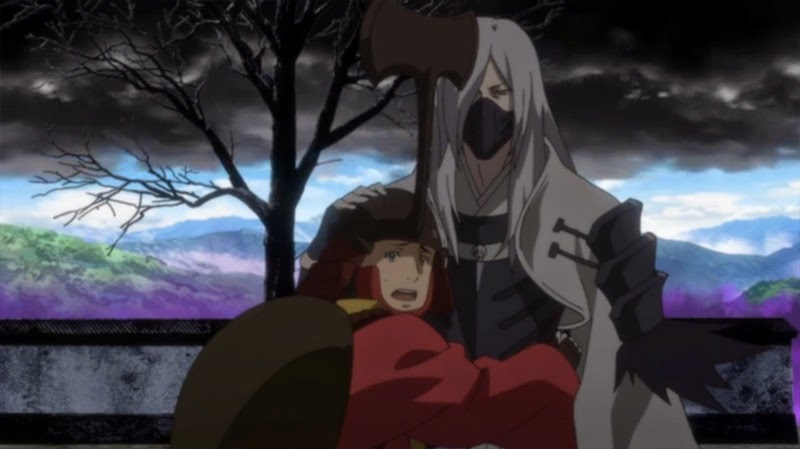 And yes him and Tenkai caring about each other is oddly touching probably because of the extreme difference between them. 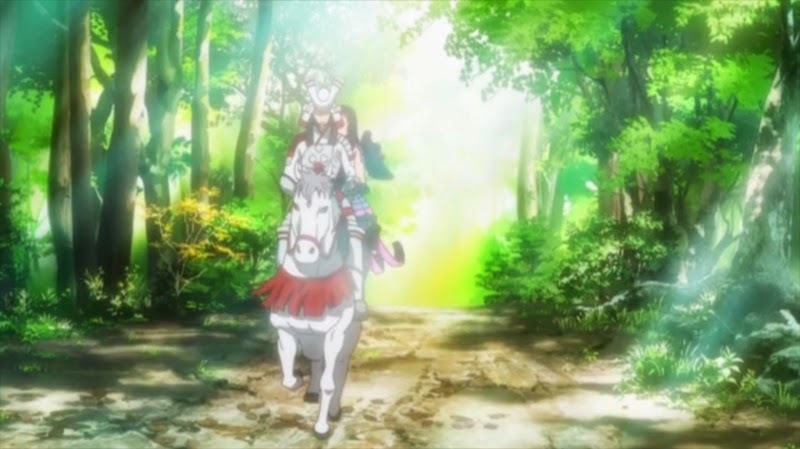 Since the people who aren't aligned with either army technically have nothing to do any more, perhaps the next episode will start with Matsu deciding that the best way to travel home is to ride off back to Toshiie on her bear with Oichi slumped behind her. 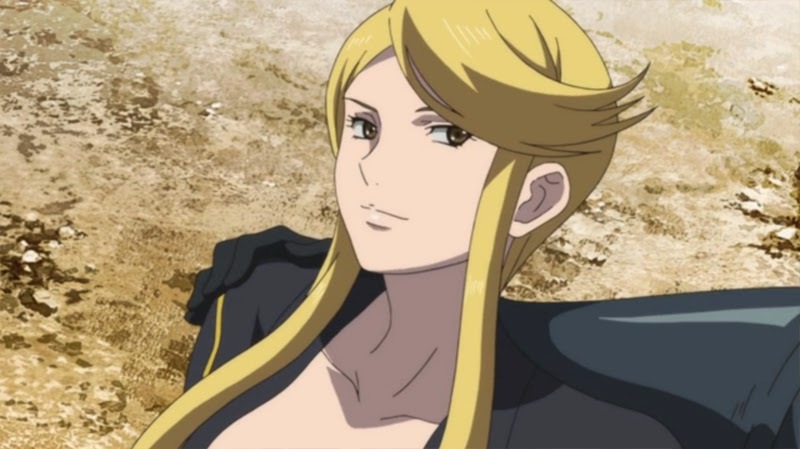 Keiji can run after her in despair while Magoichi smirks affectionately, then they can all have a big party in Kaga before the staff remember they were supposed to resolve the Mitsunari/Masamune fight this week and switch back to that. Rushed, kinda disappointed. 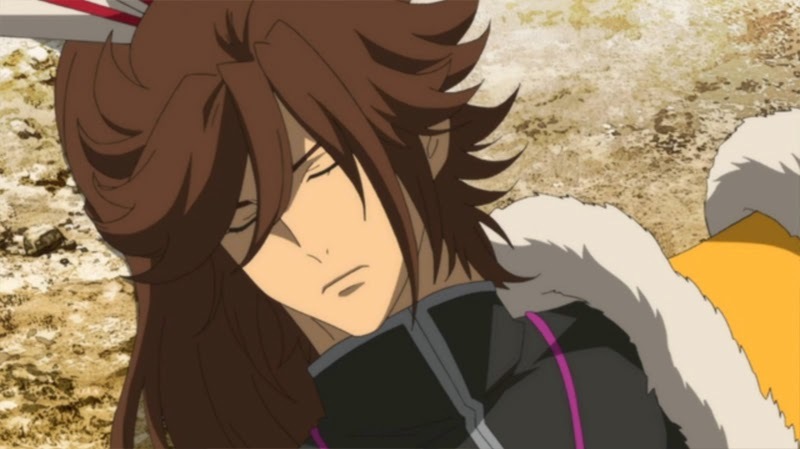 Also Ieyasu vs Yukimura was poor even for JE standards. Kojurou vs Gyobu is inusual. So Kingo does not care for his army but he does for Tenkai. Tenkai does not care for anyone yet show affection toward Kingo, that's really something. How does exactly 2 rounds of bullets from a plotoon have no effect but 2 projectiles yes ? And Kasuga popped-up from nowhere and thanks Sasuke (which was happy for it) while actually he did NOTHING to save her. 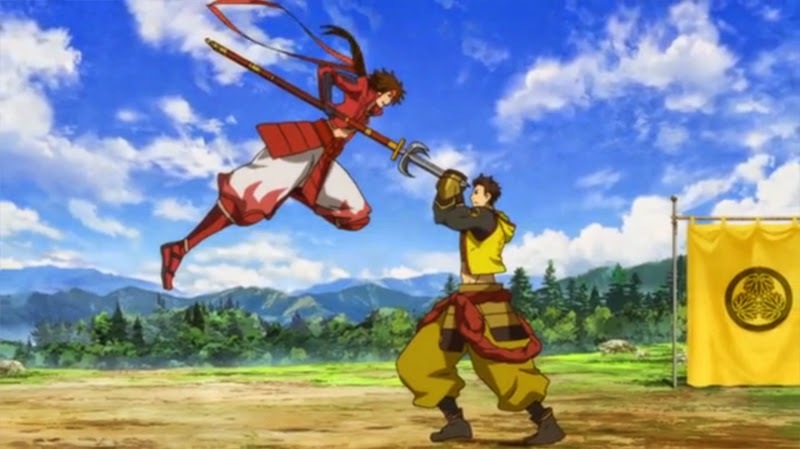 Also now Shimazu can fly. Like Kanbe. I think this episode felt more rushed than any of the ones which came before it, possibly because it felt as though it was two separate stories pushed together in the middle instead of the usual chaotic battle scenes running side by side. Last week's episode worked really well with the pacing and this one seemed much weaker in comparison. Fully demonic Oichi was an interesting sight, though. 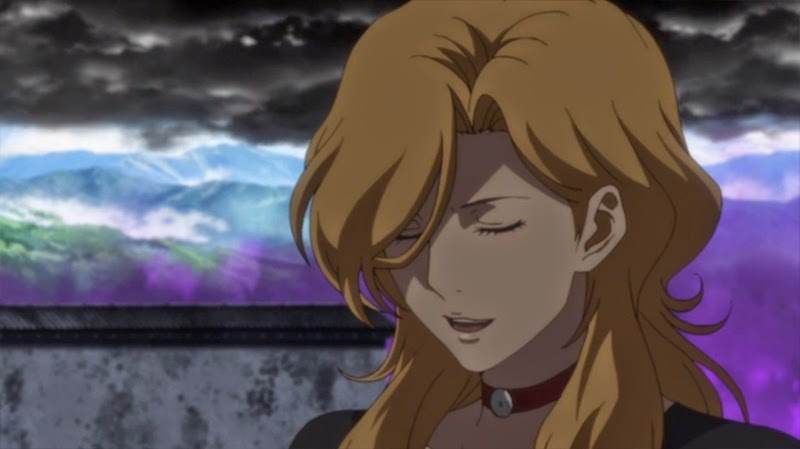 It definitely felt like they were rushing it like ”oh great, now we have this plot and these characters out of the way”, as with Sorin who retreated after converting one person. 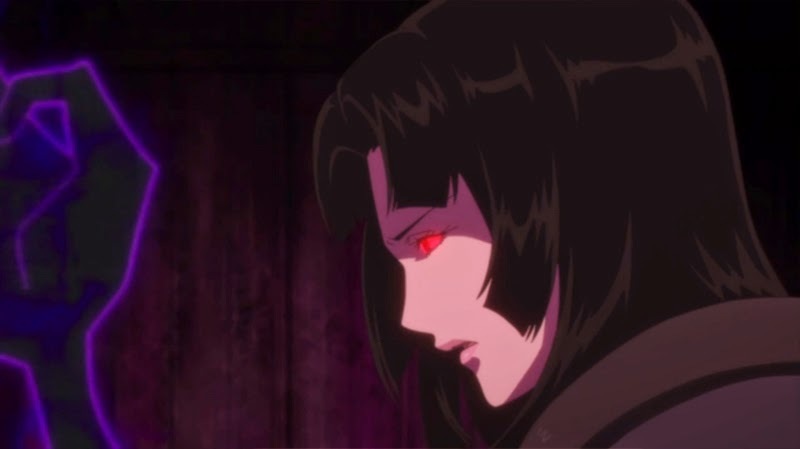 The scene with Oichi would have been really cool with more time and budget. But what can they do, with so little time? I wonder how much content they will manage to squeeze in during the two last eps and what will happen. 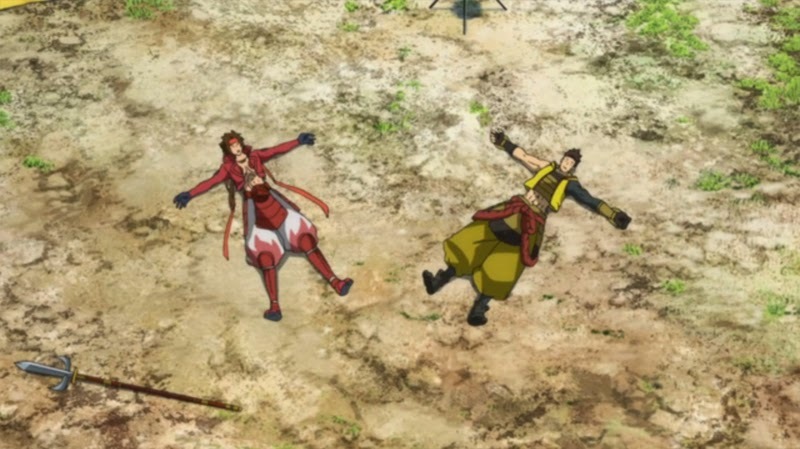 JE started so heavily that I thought that surely one of Ieyasu/Mitsunari would be killed, but now that it has turned into such a weird and often funny mess I’m not so sure. I think the climax for me was episode nine, but this episode was pretty good too; it was just so unevenly paced that it didn't work as well as the episode before. I'd like to see Oichi recover before the end but it feels as though they've probably done all they plan to with her, so she can go and join Sourin and Kingo (and Tenkai's lifeless body) on the bench. 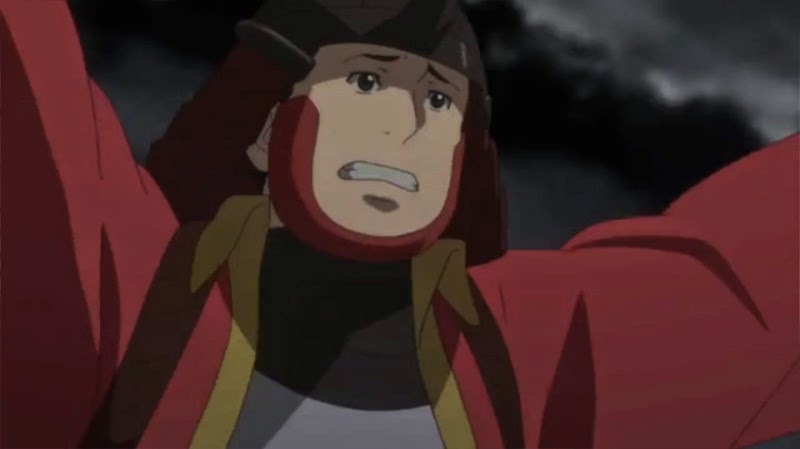 Speaking of Sourin, he could return out of nowhere to shock Motonari, I suppose; their time together in the earlier episode was good fan service for gamers but anime-only viewers must still be expecting something to happen with the two of them.